Use this cool bag instead of a gift wrapper, or as a carrier for your embroidery project, book, ebook reader... the possibilities are endless! And... a honey bun by Moda! 1. Leave a comment on this blog telling me what is [are] the project [s] you are working on this week. 2. Bonus: become a follower and leave another comment telling me so, to increase your chances of winning. This week's projects are Christmas stockings &teaching my sister to sew! I'm a follower ;thanks for the chance! Right now I am working on repurposed sweater pillow, and zippered pouches. Oh and christmas stockins too. I saw some really cute ones made out of jeans. I am going to make a nightdress for my sister's Christmas present and I'm working on an EPP hexie cushion cover too. Thanks for the give away! This week I'm making aprons for Christmas presents! This week I am working on knitting fingerless mitts and finishing up part 2 of Bonnie Hunter's East Street Mystery. I'm going to work on coaster sets with my kids for their teachers. My current project is Bonnie Hunters Mystery quilt. Thanks for asking and for the opportunity on a great draw. Love the bag. Christmas stockings! Thanks for the chance! This week I'm working on a quilt as you go tote bag. I am working on some crocheted Christmas presents for the kids and maybe a few for some friends as well. I have 4 quilts I need to finish for Christmas and I have about 30 wall hangings. Good thing my wife is helping me. Love your giveaway. I am also a follower though GFC and Reader. fab giveaway! I'm currently working on a chain link memory quilt for my friend! I'm working a new Christmas quilt for the bed....finally something Christmas-y for me! I am working on knitting some hats for my nephews! Fun! I'm in the middle of quilting my Blogger's BOM quilt. I hope to finish the quilting this evening. Great bag - my fav colours!! I'm desperately trying to find the motivation to finish my Mod Sampler quilt (it is about 11 months WiP now...hmm). Fingers crossed for your great giveaway!! This week I'm finishing a quilt for our guild's challenge. Thanks for the giveaway! Such a fun bag, thank you for sharing. I am presently embroidering then making up a cushion for a wedding present, after that I will be onto christmas decorations. This week I'm working on a skirt. Let's hope it fits! I am a follower, thanks for the chance. I just finished a dress last week, so I'm not sure what to start on this week! I am making a quilt for my grandson. i making some flannel shorts for my manskies, with elastic bands. Finishing up my new tree skirt and trying to get a small wall hanging done to match. Then backing LOTS of cookies for my girls' decorating party this Saturday. I need to make some more diaper covers before my baby gets here! A big bag for Santa Clause ! I am working on making a bean bag puff for my son. Christmas prezzies are what I am working on this week. Mainly a couple of aprons for my step-sisters. I'm finishing up some log cabin blocks. I'm making placemats for my parents for christmas! I am crocheting scarves and hats for Christmas this week...and next lol. All month my projects are hats and scarves for the homeless shelter. It seems to fill up more and more each year. I need to be making some diaper covers. I am working on 100 pairs of fleece mittens that I stupidly agreed to do for a school fundraiser. Hoping to be done by tomorrow. This weeks projects are some totes for the girls at work. Thanks for the chance! 10 iPad/kindle stands and hand stitching the binding for my quilt. I'll hopefully have some time to work on my spiderweb quilt. pj pants, stockings, and salt dough gift tags! I am crazily sewing Christmas crafts! I made a Santa Tilda doll and now I'm making a bunting and a tree skirt. Thank you for the giveaway! I am currently working on a Civil War style quilt for my boyfriend! I'm making a ton of coasters this week. My project of the week is two-fold. Gift bags and sew in frame purses. I made them for a blog hop and several folks want their own purses! I'm working on Jesse Tree Ornaments this week! I make felt sets and sell them in my Etsy shop (Pink Scissors Design) - along with Christmas stockings, quilts, Christmas garland, rag dolls, Russian Doll finger puppets. This week is all about invoices at work. Sitting on my sewing table are two bee blocks that need to be sewn. Oh and a few other things too but those are at the top of the list. I'm following. Thanks for participating in the giveaway day. I am working on my daughters Christmas Dress - A patchwork, ruffled fiasco in Red and White which will be just delightful when it is finally finished. This week I am working on car organizers for my boys. This week I've been busy knitting. I'm churning out socks for Christmas presents. I'm crocheting a backpack for one of my little girls! I am finishing the binding on a lap quilt that will be a gift. Then I need to make a pillow cover. I'm working on 2 pillow shams to match the sampler quilt I made for my sister. I'm working on an owl softie for a grandniece's Christmas present. Thank you - lovely bag. I am a new follower via gfc and newsletter. Lovely bag! I am currently machine quilting a couch quilt for my son's Christmas gift. Thanks for the chance at your giveaway. Gorgeous bag. I'm working on cards. This week is about finishing Christmas cards and then making hair barrettes for a couple of cuties on my list. this week, i'm working on new jammies for the kids! What a beautiful purse/tote! I have lots of things i could carry around! I am a quilter...your fabrics are great! and I love charm paks! I am working on a tshirt quilt. I made a needlebook for my daughter, finished my Christmas lap quilt and started some wonky stars! Thanks for the great giveaway! 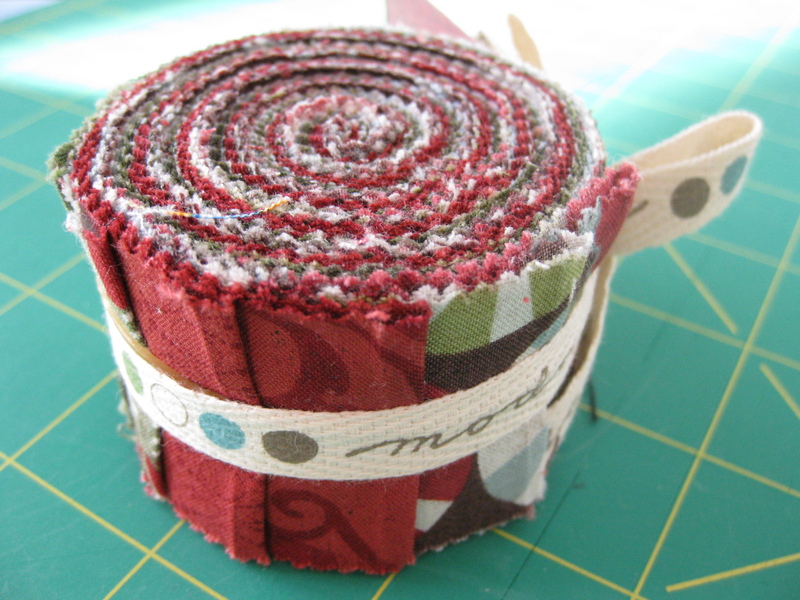 I am working on a couple of cloth I-Spy books, and getting ready to make little fleece slippers. I'm knitting an afghan for my sister. Thanks for the giveaway. I'm a new follower. Thanks. I'm making knotted fleece throws this week for my mom to give to her Sunday School students. 12 down, 3 to go. I'm working on infinity scarves for my two daughters and a friend. They're a fun quick gift to make. Thanks for a great giveaway! I'm making tree decorations for our MOMS Club. Thanks for the chance to win. I am making doll clothes for nmy daughter's advent calendar. Thanks for the chance! I'm working on making Christmas stockings for everyone in my family. I am working on finishing two quilts that will be Christmas gifts. Thankfully, I am almost done with them! Não existe nada mais lúdico do que esperar pelo Papai Noel,não importa a idade.Quando o sininho toca é emoção pura,se a caixa estiver fazia não importa...(brincadeira)quero o seu pacote embaixo da minha árvore.Sou de Petrópolis,RJ. A baby quilt. Thank you for sharing. What a neat bag! This week I am working on a new set of pajamas for my son's pajama day at school. I am also working on doll clothes as a gift for dd. Thanks for the giveaway. Hey sweetie, awesome bag, thanks so much for letting us have a chance to win it! I am a papercrafter, so I am working feverishly on Christmas cards at the moment. Have a wonderful Christmas and thanks again for participating in this great giveaway! I follow you via GFC as Maureen Hayes, thanks for the additional entry and the chance to follow your awesome blog. This week my goal is to finish throw pillow covers for my Grandma and my sister-in-law! Working on a pillow for a holiday swap -- thanks for the giveaway! This week I'm working on a travel sewing kit by lots of pink here! and thank you so much for this giveaway! My children and I are preparing to have a mini craft bazaar to raise money for orphans and widows in Malawi, Africa, where my husband's parents live and work as missionaries. This week I am working on stockings, and a stealth project for my daughter for christmas. I am working on a pineapple block from leftovers. Thanks for the chance. This week I'm working on some mug-rugs. A table runner and a table mat. Thanks for the great giveaway! This is lovely.This days I am crocheting hat for my daughter.Lovely giveaway,thanks for the chance to win it. This week I'm desperately trying to finish up a really cute skirt for myself. I also want to finish a crochet scarf for my son and start a dress/romper for my daughter. I'm working on Christmas projects - tree skirt, stockings and table toppers. I'm a new follower - thanks for the giveaway! I am working on some Christmas scarves for my son's teachers and day care providers! Thanks for the giveaway! Amy @ gasudimack(at)sbcglobal(dot)net. Working on a messenger bag for my boy for Christmas, but it is slow going since he is always around. This week I'm working on dolls, gift bags and quilting! This week I am working on a pair of flannel pants for my 3yr old. I am embroidering some Sun Bonnet Sue blocks to put in a quilt. I am trying to finish up the huge pile of pillowcases I want to make for the family and a few small table runners. Luckily the tops are done, I just have to quilt them. I am trying to work on a messenger bag for my boy, but alas he is always around so it is slow going. I am working on a quilt for a charity! I'm working on finishing up some ufos. I am working on about 20 placemats for Meals on Wheels. They are all made from repurposed men's shirts. Im working on a small tree wall hanging. I am currently working on a 4th of July quilt. How crazy is that!!!!! I'm working on a quilt and a knitted shawl for my mum. RIght now, I am starting (shudder!) Christmas presents for family and friends! I am hopefully working on some art caddies and purses for nieces, fingers crossed I don't get distracted! I am finishing up a quilt for my grandson's birthday, December 13. It is hidden stars. Thanks for the give-a-way! This week's project is a couple of aprons as Christmas presents for my friends, although I don't think that I'll be getting much done as I'm spending all my time checking out the great web giveaways!! I am a new follower and look forward to checking out your blog. I see from your comments about stash that we already have a lot in common! Working on studying for finals so I can sew after the semester's done! This week I'm making curtains for two rooms in our house. I can't wait to be done so I can move on to something more fun! I am making a tote for a friend this week. 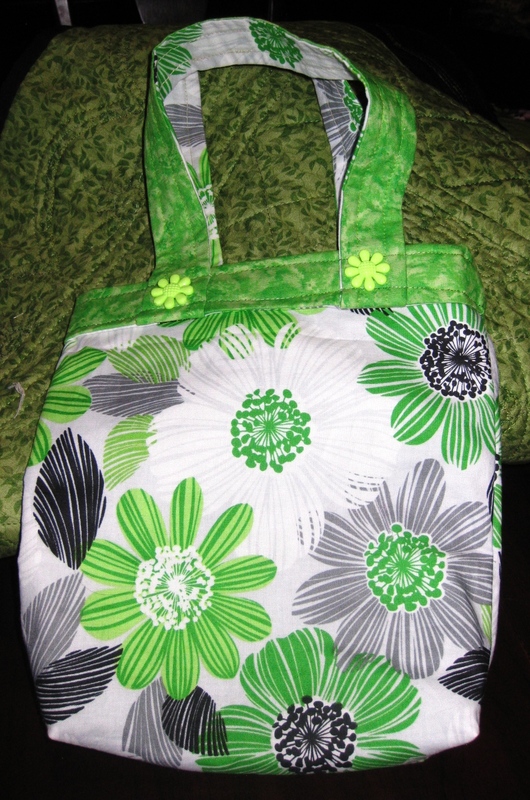 I take clothesline and wrap strips of cloth around it and then coil and sew it into a tote. I made one of these for myself and my friend was drooling over it. My friend recently lost her mother and this will be a tough Christmas for her. I think she will love this surprise tote she is getting. HI IM'WORKING ON CHRISTMAS ORNAMENTS THAT LAY FLAT TO DECORATE OUR GIFTS! THANKS FOR SHARING A NEAT GIVEAWAY! I'm working on two babyquilts. Christmas presents for family members. A couple of pillows and pouches for nieces. Thanks for the chance. I'm a new follower and looking forward to reading your posts. I have to get a quilt basted, quilted and bound this week for my older daughter for Christmas and at least another quilt basted! Thanks for the wonderful giveaway! I've been making quilts for Hurricane Sandy victims ever since the storm hit in late October, so that's what I'm working on this week. So far, with the help of quilters around the world, I've delivered more than a dozen quilts! A lovely counted cross stitch lighthouse for my MIL. I'm crocheting a scarf! Thanks! I need to make a gift for the ladies christmas. dont know what yet. I am working on quilting a good size flannel quilt for a gift. I'm working on a blackboard cloth play mat for my granddaughter. Thanks for the giveaway!